Triggered by the appearance of a cookbook with beautiful marrow bones on the cover (Bones van Jennifer McLagan), I have adapted two medieval recipes with marrow. The first, for pasties with marrow, is here, where you can also read more about marrow and marrow bones. On this page is the second recipe. 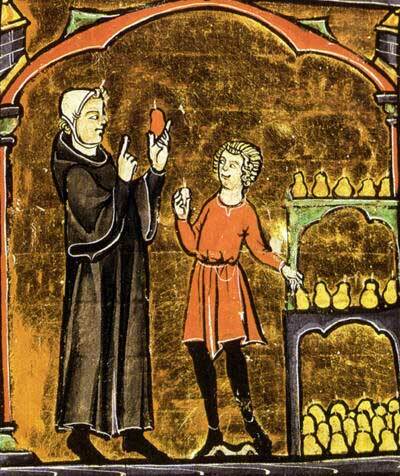 Both recipes are taken from the early sixteenth-century manuscript UB Gent 476. A quince can be the shape of an apple or a pear, and is related to both of them. More about quinces at the recipe for Quince Pie. Quinces stuffed with marrow may seem a strange combination. But replace quince by apple and bone marrow by butter, and the recipe is much more recognizable and acceptable. The stuffed quinces were cooked in a liquid, or baked in a pasty. Because the ‘slurpertjes’ are also pasties, I have chosen for a recipe of quinces cooked in wine. The recipe is from the ms UB Gent 476, but Karel Baten (Carolus Battus), using practically the same recipe, describes how to serve the quinces once they are cooked in his Seer excellenten ghe-experimenteerden nieuwen Coc-boeck from 1593: “snijdt snekens wittebroot in u schotelkens ende set daer u peeren op ende gieter u sop over ende dienet ter tafelen” (‘Cut slices of white bread in your dishes and set your pears (=quinces) on them and pour your juice over it and serve it forth’, see bibliography p.5 col.1). There is another recipe for marrow-stuffed quinced in vol.3 of the Gent convolute KANTL 15 (edition Braekman, recipe nr 263, see bibliography). In this recipe the marrow is spiced with cinnamon and ginger, the wine is red instead of white, and there are no currants in the stuffing. 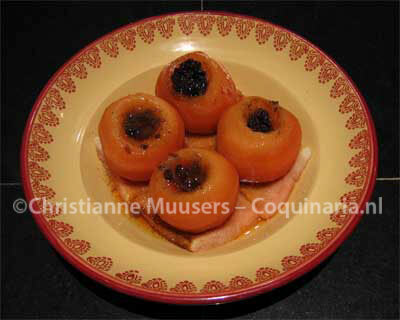 Other recipes with quinces on this site: Medieval stuffed goose, Quince cake, Murri. From manuscript UB Gent 476.This cookery book has no title, nor is it known who was the author. The first pages contain a list of recipes which was added later, the recipes start on a new page without preliminaries. On the last page of the manuscript there are some scribbles of owners or users, indicating that by the end of the sixteenth century this manuscript probably belonged to a family Vander Strinck. This cookbook has many tasty recipes, but also some remedies and -quite rare in those days- a survey of the order in which dishes were to be served. However, this list is quite arbitrary and incomplete. A modern edition appeared in 1989, by Ria Jansen-Sieben and Johanna Maria van Winter, a revised edition appeared in 1998. (see bibliography). Quinces with the marrow in juice. Take your apples (=quinces), peel them and remove the core. Put marrow and currants in them and take white wine and sugar and serve them when they are well stewed. Prepare one quince a person, but if the quinces are very large and the meal is copious, a half quince is enough. The marrow pasties were quick and easy, but this dish takes a little more time to prepare. Quinces take one and a half to two hours to cook. But you do not need to watch the pan all the time, so it’s not that bad. What IS bad, or at least a nuisance, is removing the cores. Quinces are very firm, my apple corer was no use. Best just use a pointed knife to make a conical incision at the side of the stalk, end then just scrape until you have removed the whole core, including the white membrane around it. In the Middle Ages a ‘crauwelkin’, a small meat fork with curved prongs, was used for this. The pips can be kept and frozen for making jelly or jam. By the way, the quinces on the picture were not coloured from using red wine or Photoshop. They turn this lovely colour all by themselves, just from being cooked. For 4 persons as side dish; preparation in advance some hours for steeping the marrow bones + 15 minutes; preparation 2 hours. Boil the soaked marrow bones (see recipe for ‘small slurpers’) twelve minutes in beef broth or salted water. Let cool slightly, push or scoop out the marrow and chop immediately. Add the currants. Peel the quinces and core them. Take care not to slice through the bottom, to prevent the marrow from leaking out. Stuff the quinces with marrow and currants. Choose a cooking pan in which the quinces will fit snugly. Sprinkle 200 g sugar on the bottom of the pan. Put the quinces on the sugar, and pour wine in the pan, taking care not to pour wine into the stuffing. Start with 500 ml wine, add more until the level has reached to about a half inch/1.5 centimter below the top of the quinces. If you need more than 750 ml wine, add some extra sugar. Bring the wine to the boil, cover the pan with a lid, and let the quinces stew for one and a half to two hours. Take the pan off the fire one hour before serving, but leave the quinces in the wine. The quinces and the juice have now turned a beautiful colour. Just before serving, toast four slices of white bread without crust. Not piping hot, but definitely warm. Marrow sets again when it cools. Put a toasted slices of bread in each dish, arrange a quince on it, and pour some of the liquid over it. You can also make a kind of apple dumpling with this recipe: Mix marrow and sugar in equal quantities, add some currants and cinnamon, stuff the quinces. Roll out puff pastry (sweetened if you like), sprinkle some sugar and cinnamon in the center, place the quince on it. Bring up the dough, moisten the edges and pinch sealed. Cut away all excess dough. Bake in the oven for 90 minutes on 175 °C/350 °F. These are dried grapes. There are several kinds of raisins, depending on the kind of grape that was used. Sultana’s are NOT raisins a special brand, but the dried berries from the sulatana grape. Currants are original the dried grapes of a grape variety with small berries that was grown in Corinth (Greece). There are more varieties used for raisins, like the Seedless Thompson. Carolus Battus, Medecynboec[…]. Hier is oock byghevoecht, eene seer excellenten, gheëxperimenteerden nieuwen Cocboeck. Dordrecht, 1593 (online edition). Jennifer McLagan, Bones: Recipes, History, and Lore (2005) In 2008 published again as Cooking on the Bone .